Dey Street Books, 9780062657138, 320pp. The author of the critically acclaimed Your Favorite Band is Killing Me offers an eye-opening exploration of the state of classic rock, its past and future, the impact it has had, and what its loss would mean to an industry, a culture, and a way of life. Since the late 1960s, a legendary cadre of artists—including the Rolling Stones, Bob Dylan, Neil Young, Bruce Springsteen, Fleetwood Mac, the Eagles, Black Sabbath, and the Who—has revolutionized popular culture and the sounds of our lives. While their songs still get airtime and some of these bands continue to tour, its idols are leaving the stage permanently. Can classic rock remain relevant as these legends die off, or will this major musical subculture fade away as many have before, Steven Hyden asks. In this mix of personal memoir, criticism, and journalism, Hyden stands witness as classic rock reaches the precipice. Traveling to the eclectic places where geriatric rockers are still making music, he talks to the artists and fans who have aged with them, explores the ways that classic rock has changed the culture, investigates the rise and fall of classic rock radio, and turns to live bootlegs, tell-all rock biographies, and even the liner notes of rock’s greatest masterpieces to tell the story of what this music meant, and how it will be remembered, for fans like himself. 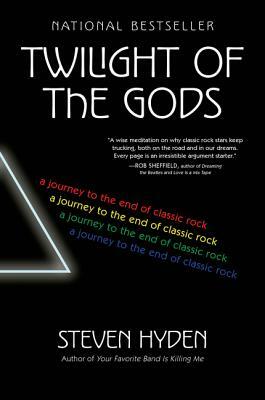 Twilight of the Gods is also Hyden’s story. Celebrating his love of this incredible music that has taken him from adolescence to fatherhood, he ponders two essential questions: Is it time to give up on his childhood heroes, or can this music teach him about growing old with his hopes and dreams intact? And what can we all learn from rock gods and their music—are they ephemeral or eternal? Steven Hyden is the author of Your Favorite Band Is Killing Me. His writing has appeared in the New York Times Magazine, Washington Post, Billboard, Pitchfork, Rolling Stone, Grantland, The A.V. Club, Slate and Salon. He is currently the cultural critic at UPROXX, and the host of the Celebration Rock podcast. He lives in Minnesota with his wife and two children.